Common Core Reading: Difficult, Dahl, Repeat : NPR Ed Backers of the Common Core say it's important for kids to tackle complex texts. Critics argue that reading shouldn't be a struggle for kids. We'll visit one classroom that borrows from both sides. 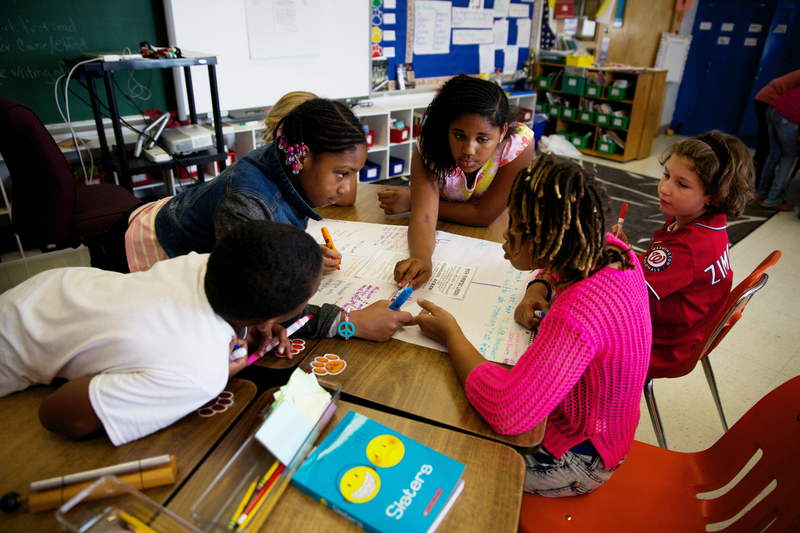 Fifth-graders discuss the meanings of difficult words during a Common Core-inspired reading lesson. The last in our four-part series on reading in the Common Core era. All week we've been reporting on big changes in reading instruction brought on by the Common Core State Standards: a doubling-down on evidence-based reading, writing and speaking; increased use of nonfiction; and a big push to get kids reading more "complex texts." Whatever you think of these shifts, they're meaningless ideas without a classroom and kids to make sense of them. That's today's story, as we round out our series on reading in the Core era. It's midmorning at Watkins Elementary in Washington, D.C. From the fourth floor, Amy Wertheimer's fifth-grade classroom looks out over a red-brick grid of row houses and, looming over it all, the U.S. Capitol. But every back is to the view as Ms. Wertheimer calls her kids to the reading rug. "All right, we are on the carpet in 5 ... 4... "
The students force their rubbery legs, full of early energy, to criss-cross applesauce. Each has a binder. Inside is evidence that the Common Core State Standards have been here. The kids are reviewing a bit of nonfiction — what the Core calls an "informational text" — titled "Who Settled the West?" It begins with the Native Americans, then moves through the arrival of Europeans and into the 19th century migrations of Mormons, former slaves and gold seekers. For many of the kids, it was a tough read. Or, to use the Core's vocabulary, "complex." Which is why they're now tackling it together, as a class. Ms. Wertheimer warms them up with a text-dependent question: "Are all of these native peoples nomadic?" The kids comb through the text, line by line, word by word. What makes the text tough? The language, for one. Words like "prejudice" trip them up, as do some of the Native American names. If "Haida" is a speed bump for these readers, "Tlingit" is a brick wall. 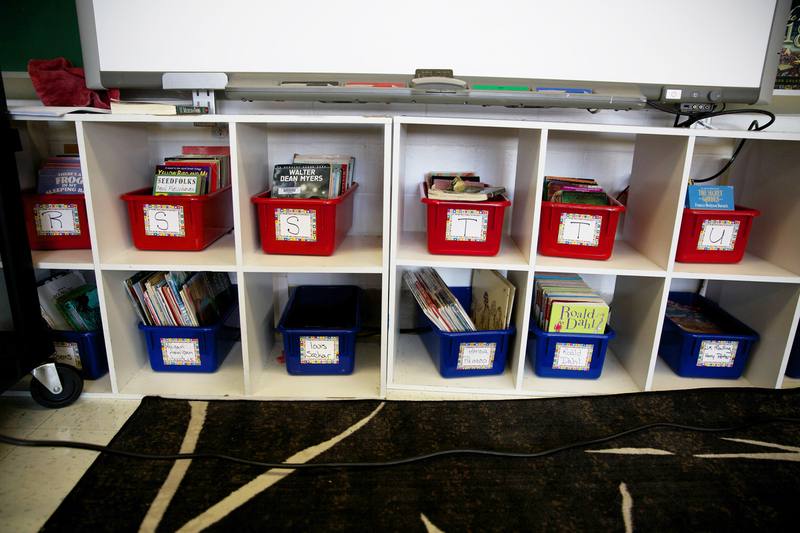 These books for daily, independent reading have been sorted by difficulty and labeled with letters. Popular writers, including Dahl and Rowling, get their own bins. But once Khalil Sommerville struggles through them both, he does something just as hard, something the Common Core really wants him to be able to do: He answers Ms. Wertheimer's question using evidence from the text. "On page 6, paragraph 2," he says, "the first sentence: 'The Haida and Tlingit of the Northwest built permanent wooden homes called longhouses.' "
Khalil flags the word "permanent" — in other words, not nomadic. After an attaboy for Khalil, Ms. Wertheimer asks about the Sioux. Destiny Brown volunteers: "Page 6, on the first paragraph, at the end it says, 'They lived in tents called tipis.' "
This kind of classwide reading seems to engage the kids. Lots of hands shoot up. When Ms. Wertheimer notices a wallflower, she finds a way to include him. It's also tiring work for the kids. So, after 20 minutes, they break into groups. One cluster of 10-year-olds dives into the packet, looking for reasons why African-Americans headed west before and after the Civil War. Kandice Norris scans the text, finds a key quote and offers up Reason One: Former slaves could find paid work in the West. Novaun Lee chimes in with Reason Two: Even before the war, slavery was illegal in the West. Ms. Wertheimer walks from group to group, helping and encouraging the kids to show evidence for their answers. She's been teaching for 17 years and says this shift to reading more complex material is a big difference, and she loves it. "This pushes them," she says. "And the high kids aren't bored, and the low kids aren't bored. And we're all learning about really interesting things." It's at this point that I have to mention Ms. Wertheimer's hair — a serious salt-and-pepper bob. But along the bottom runs a surprising fringe of dyed-pink hair. 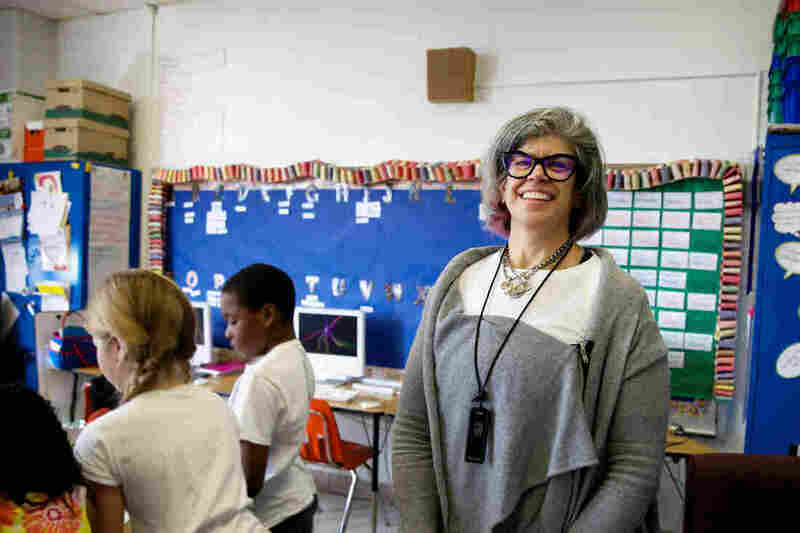 A 17-year veteran of the classroom, Amy Wertheimer teaches fifth grade at Watkins Elementary in Washington, D.C. It's a perfect metaphor for how she — and lots of teachers — are approaching reading in the Common Core era. Not as an either-or proposition. The Core standards don't say everything kids read has to be salt-and-pepper serious and seriously hard. There's still plenty of room for pink. That's why kids here have leveled libraries. Leveling pre-dates the Core. It's a way of labeling books based on the skill needed to read them. In many schools, leveled reading once drove instruction. Kids would spend their entire day reading at or close to their comfort zone. At Watkins, daily independent reading with leveled books provides a counterbalance to the tough stuff, a breather. Next door, in teacher Kate Sommerville's fifth-grade class, Tonyae Butler sits quietly at her desk, reading Roald Dahl's The Witches. She has already plowed through his other classics, including Matilda and James and the Giant Peach. Tonyae says the book is actually below her reading level, but that's OK. She's having fun. And that's the point. Still, I assume she prefers Dahl to the close-reading binder on her desk. They'll be tackling a tough, new article shortly. "Do you think it looks kind of tough?" I ask. Her answer: "I think it looks interesting and tough." To my surprise, Tonyae says, one thing can be both.